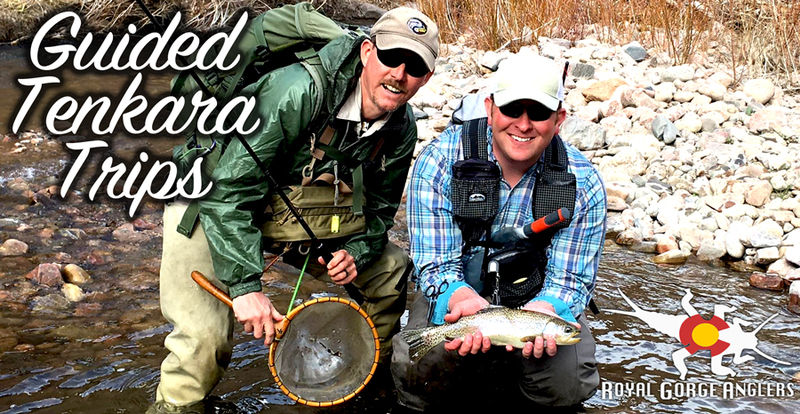 Royal Gorge Anglers' tenkara guides specialize in backcountry trips in the canyons of Colorado's southern Rocky Mountains, with a focus on small water effectiveness with fixed-line fishing. We can accomodate a wide range of experience levels, ranging from anglers who are just starting out with tenkara, to experienced tenkara anglers who are looking for new backcountry adventures. We cover everything from traditional Japanese methods and fly patterns to cutting-edge American tenkara techniques such as nymphing, "matching the hatch", and terrestrials to name a few. We're not afraid to push the tenkara envelope, but we also value tenkara's historic Japanese roots. Tenkara isn’t just for small water! Pushing the limits of tenkara is something we’ve spent a lot of time working on and perfecting. Taking tenkara to a larger river like the Arkansas will be an experience that will greatly expand your knowledge of fixed-line fly fishing on one of the top 10 trout fisheries in North America. The Arkansas holds more than a hundred miles of Gold Medal Water, and the granite crack of Bighorn Sheep Canyon is the epicenter! There we’ll focus on the huge pools, pockets, and boulder-studded edges along the river. Our tenkara guide has combined tenkara’s simplicity with innovative big-water techniques that produce, whether you’re casting dry flies, using traditional Japanese kebari patterns, nymphing, or throwing a hopper-copper-dropper rig. All are possible with a tenkara rod! Helping new or experienced tenkara anglers alike understand larger water and learn how to be effective is our goal. Your guide will provide all transportation, guiding and instruction, including a riverside lunch featuring unique, homemade cuisine.